A hand held handle hand pump sprayer that is perfect for any home and garden use. A replacement filter screen for Birchmeier wand handle sprayers. Birchmeier replacement telescopic extension for Birchmeier REC 15 ABZ Backpack sprayer. Rubber cone seal replacement part for the B&G Foot Ram. Tune up kit for B&G sprayers. A replacement nozzle for Birchmeier models Flox, Senior, Iris, and Profi Star 5. A professional mobile delivery system designed to perform precision exterior and perimeter applications. Clean rechargeable lithium ion powered advanced pest control spray system with 8" brass wand. Choose from 1.5 or 2.5 gallon tanks. VC-165 Valve cable 36 inch for B&G professional sprayers. A battery operated 4 gallon (15 liter) backpack sprayer with durability and long-lasting efficiency. A tip that is designed for any crack or crevice area on any residential or commercial sites. A replacement stainless fluid cap for the aerosol sprayer units. A replacement lid assembly for Birchmeier Flox and REC 15 ABZ backpack sprayers. A heavy-duty stainless steel high-pressure spray gun that quickly adjusts from fine mist to long distance stream. A replacement part that you can use with your Prescription Treatment System III applicator. A stainless steel extension for QD and non-QD wands from Actisol. A lightweight and highly flexible twin coiled hose that helps in reaching tight spaces on any residential and commercial sites. Actisol Twin Hose Assembly with Quick Disconnects 50 ft.
A lightweight twin hose with quick-disconnect connectors that makes reaching tight spaces easy for residential and commercial areas. A tank filter that automatically removes any debris that may clog and damage an Actisol Unit. An extension brass tube wand for Birchmeier hand-pump and backpack sprayers. Crack and Crevice replacement for Birchmeier DR-5 Duster. 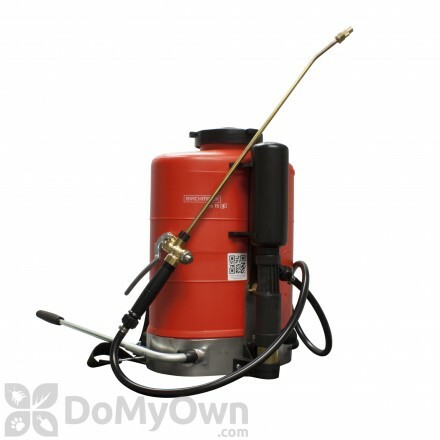 A professional 50 gallon skid sprayer that is ideal for large pest control jobs on lawns and perimeter termite control. TrueTech 50' yellow airline with brass quick connects for the TT 2000. A replacement compression air valve for the Birchmeier DR 5 Duster. Actisol Twin Coiled Hose Assembly with Quick Disconnects 15 ft.
A lightweight and highly flexible twin coiled hose with quick-disconnects that helps in reaching tight spaces on any residential and commercial sites. Airofog Benjamin Airosol Generating Sprayer 16 oz. A professional portable aerosol system for deep penetration of insecticides into voids and cracks & crevices in commercial & residential areas. B&G Replacement part pencil tip for B&G 2 Quart Duster 1152-A. TrueTech slab rod assembly is for slab injections and with drain covers for foaming drains. Designed to help maintain a consistent pressure in the spray tank. 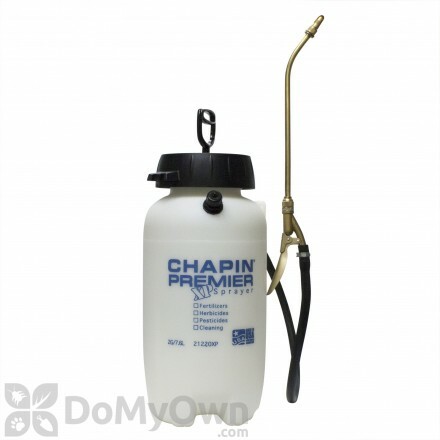 An all-in-one nozzle replacement that may be used with numerous Chapin sprayers. 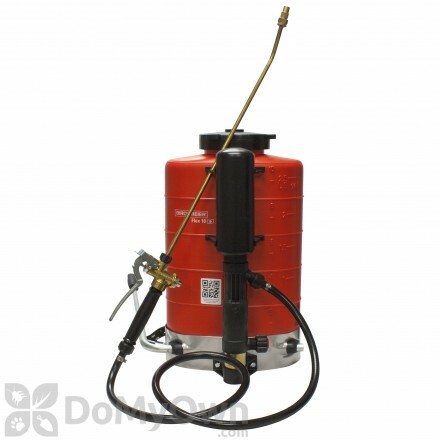 A professional 100 gallon skid sprayer that is ideal for large pest control jobs on lawns and perimeter termite control. Siphon injector to dilute concentrated solution. Replacement left shoulder strap for Birchmeier Backpack sprayers. A ULV mister specifically designed to spray antibacterial agents at a droplet size targeted to kill the living virus on surfaces. An extension pole to be used on hard to reach places and heights for dusting. 12 Volt on Demand Electric pump that delivers 3.0 GPM and 60 PSI. 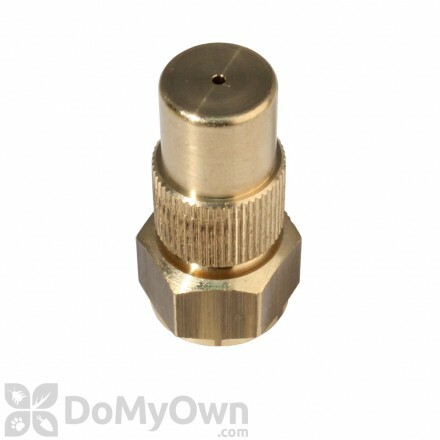 A replacement valve for Birchmeier Flox 10 Backpack Sprayer. A valve that gives a constant flow of 21 psi (1.45 BAR) with fewer pumping strokes and easier pumping. A replacement 1.5m hose for the DR-5 Duster. A hand pump backpack sprayer that provides comfort and prevents user fatigue with its new design and enhanced features. 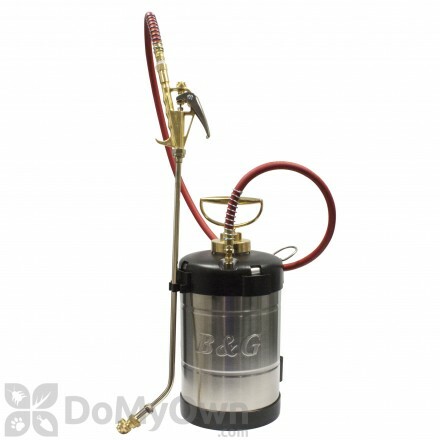 A 0.5-gallon capacity compression sprayer that features brass, stainless steel construction and 18-inch extension wand. 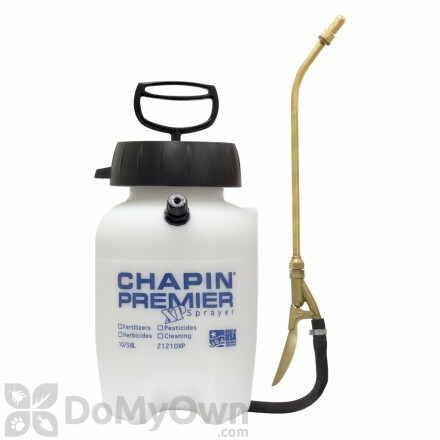 A 0.5-gallon capacity compression sprayer that features brass, stainless steel construction and 9-inch extension wand. An aerosol sprayer with a 6-inch long spiral flexible wand that will treat all possible angles for application.